Today’s tour has set ourselves in love, not only for the beauty of the landscapes we pass through, also because the point of origin and destination are by themselves worth the visit, so is an excellent way to create a tour that combine landscape, a little exercise, history and a visit to two beautiful sites in Mallorca. How long is the tour? 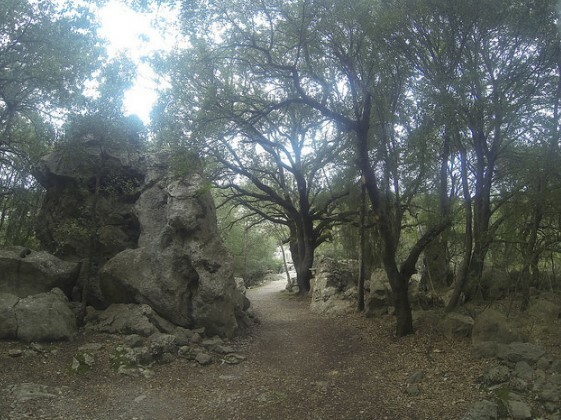 It’s about 12 kilometers starting from the Sanctuary of Lluc, and ending in Pollensa, it can take about 4 short hours walking time, although it depends on the pace. To this we must add the time to dedicate to the different stops, because there are many points of interest along the route. With children or without them? You can do it well with children, the terrain is not difficult as it is downhill or flat. Where to park? In the Sanctuary of Lluc or in Pollensa, actually the ideal is rather to leave cars at each site, or leave the car at Pollensa, and revise schedules to go by bus from Pollensa to Lluc . Tips for the tour? Bring water, food and camera. During the tour we will pass a source where we can replenish water. This excursion was conducted on Sunday 1 March 2014. Why we like this excursion Lluc to Pollensa? Because it is a very easy hike which makes it ideal for everyone, and runs one of the three main access routes to the Sanctuary of Lluc, formerly widely used way, combining different types of landscape and great views. We started our tour at the entrance to the Sanctuary of Lluc in the area of ​​the porches, a space before used to accommodate the numerous pilgrims who came to Lluc with their horses, and that now has turned into rooms to stay. At the end we will see a door that leads us to a path parallel to the torrent, pass the botanical gardens, then we cross the soccer field, and here the path is now well defined, in fact we have already entered to what was the royal road from Pollensa to Lluc, royal roads were created by the state in order to connect two points of special interest. Remarkable in this part of the road is to see on our left the karst landscape as a result of indirect dissolution of calcium carbonate limestone rocks due to the action of rainwater, an especially complex process that leads to spectacular reliefs. So we arrive to a fence that has a wooden ladder that will help us to pass it, and walked a few meters to the left along the road until the entrance to the estate of “Menut and Binifaldó”. We go this way a few minutes to then see an old lime kiln, which show us the way they used the land and the economic activities in the Sierra de Tramuntana, before the start of mass tourism. We continue the asphalt road in slight rise, leaving on our right the houses of “Menut”.About 20 minutes after we arrived at Binifaldó houses, situated at the bottom of Puig Tomir. The houses are located in a beautiful setting, surrounded by farmland, where we still see sheep grazing, which will delight the little ones. 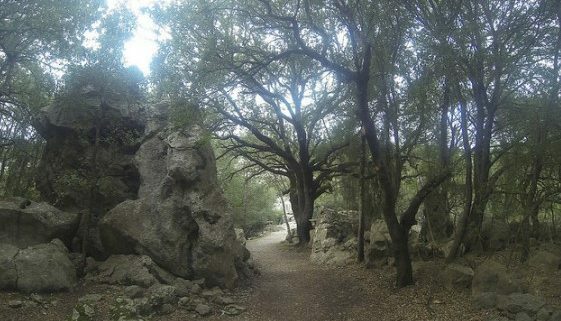 From here, we take a dirt road (perfectly identifiable and recognized), along which we will find many information panels on the flora of the area, and find the “Alzina den Pere”, an oak that is over 500 years old! 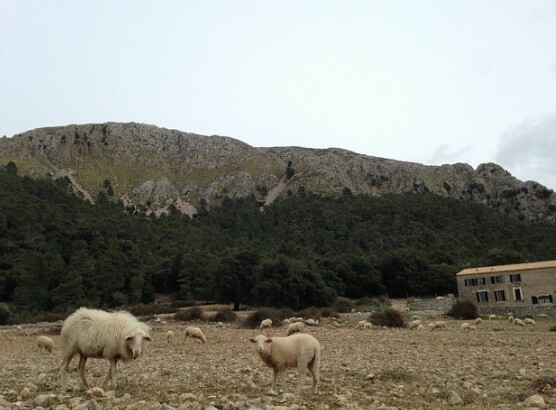 Later we will enjoy the views of this area of ​​the Sierra de Tramuntana, and even of the beautiful Bay of Pollensa. On clear sunny days, it is even possible to see the profile of the island of Menorca! Thus, we arrive at the point where we must stop for a snack and a glass of wine, a coffee and shot of herbs, there is nothing like go prepared to hike! The place to stop is the” Fuente de Muntanya”, name of the farm where we are. 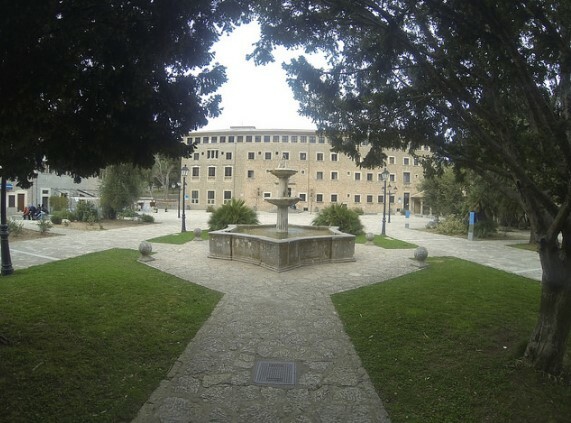 The site is beautiful, and a few years ago was conditioned the bridle path and the surroundings, putting a table and stone bench and is now a perfect place to make a stop as long ago did the pilgrims heading to the Sanctuary of Lluc. 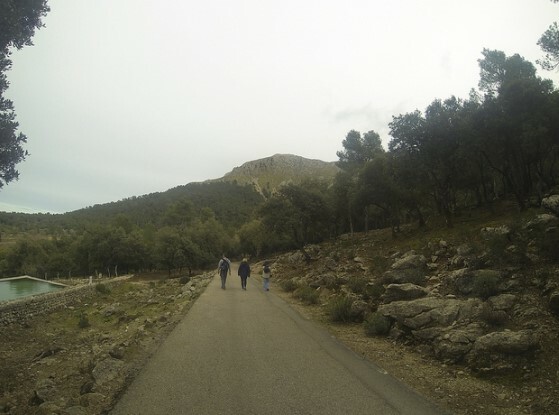 We got to the road, where highlights a large pine (Pi de Son Grua), and from there we follow a small path that runs parallel to the road and valley of Marc until we reached our final destination: the town of Pollensa.